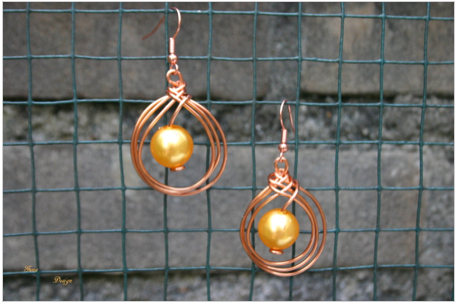 de Cor's Handmades - Malaysia Handmade Jewelry: What is that jewelry site for? What is that jewelry site for? No i did not save the file and use it here, I screencaptured this so this is my own image file. If you are into jewelry making long enough, you will know what I am talking and where am I pointing. Shame on you, site admin. No I am not going to mention your website's name, why should I give you a free advertisement? 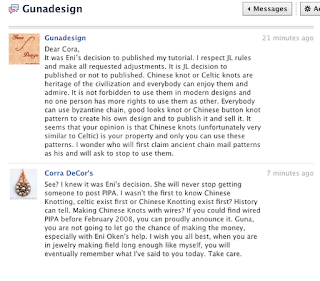 It was Eni’s decision to published my tutorial. I respect JL rules and make all requested adjustments. It is JL decision to published or not to published." 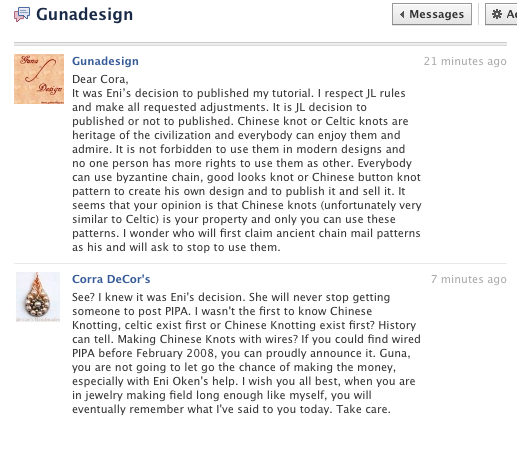 Incident like this happens once every two years, it was exactly two years ago (July 2010) Sue Duan from Taiwan published her own version of PIPA tutoria, sueduan claimed that she had never seen PIPA before, which was a lie, Gunadesign said the same thing too and really, I believed Gunadesign, because all the messages exchanged were humble and polite, what I can't get over is, the person who'd approved the tutorial - knowing exactly what it was. Shame on you, site admin. And you, you artists should just stop selling there and go to Craftsy, and sell them fast before anyone write their own version of your design to sell, since no one cares. And in Craftsy you sell for free, they do marketing for you also, yo! - Comments being removed by site founder as expected. Account being deleted from the site, as expected too.